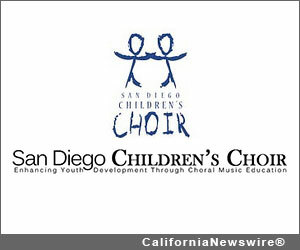 SAN DIEGO, Calif. /California Newswire/ — The San Diego Children’s Choir (SDCC) will perform its annual Holiday Concert and Community Sing-along on Sunday, Dec. 9, at 3 p.m., at The First United Methodist Church of San Diego in Mission Valley. The children will sing selections from Benjamin Britten’s A Ceremony of Carols and include traditional favorites such as The First Noel, Joy to the World and Silent Night. The public is invited. As the 2013 centennial of popular British composer Benjamin Britten nears, the San Diego Children’s Choir will honor the occasion with some of his most imaginative and beautiful choral works written for the holidays. A Ceremony of Carols requires impeccable intonation, strong vocal performances and precise discipline. The Choir will perform these works with the delicate and resonating trills of a harpist. This program will also include classic holiday sing-along songs printed in the program book for audience participation. Singing is encouraged and all voice types are welcomed as the community gathers in celebration. This performance consists of over 300 choristers from the San Diego Children’s Choir including the core program choirs from grades 1-12 and the SDCC Neighborhood Choir outreach choristers. SDCC will be holding auditions in December and January for its next season. Please call 858.587.1087 for more information and to schedule an audition. No audition is required for grades 1-2.